Erica Bunker | DIY Style! The Art of Cultivating a Stylish Wardrobe: Reading Between the Lines! Sometimes when your sewing mojo has taken a hike, the easiest way to motivate one's sewing self is through pure magazine inspiration. In the age of all things digital, it's good to fall back on the satisfaction of simply flipping through the glossy editorial pages of a fashion magazine. At one point, I thought Issuu.com and Pinterest had almost ruined the experience for me. But it's just something about daylight savings time and the turn of the new season that inspires me to grab an actual magazine. No matter how many Pinterest boards I create, I still love to rip out those pages and push pin them to my inspiration corkboard. I must know what they think is hot! My inspiration for this dress was pulled from the pages of the April 2015 issue of Marie Claire. The dress is Alexander Wang Pre-Fall 2015. 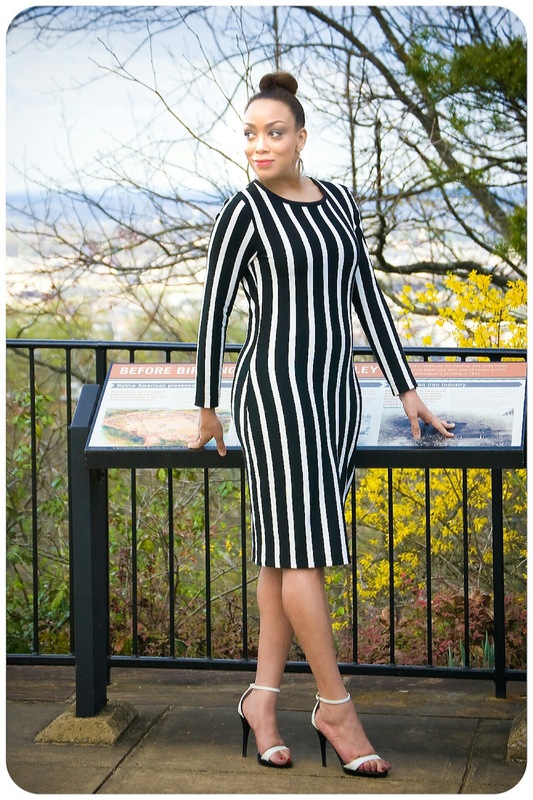 I had recently purchased this fabulous striped ponte knit from Mood Fabrics.com. The weight and quality of this ponte knit is unlike any I've ever felt outside of a ready-to-wear garment. If you're looking to make a fitted body-con dress, then I suggest you seek a ponte knit swatch from Mood. I used McCall's 6886, once again. This is such a great basic pattern that is perfect for when you have a spectacular fabric that you want to be the star. I used the same cut pieces as before, which was the size 14. But I needed to shave down the sides by 1.5" each. The stripes run horizontal... selvage to selvage. But I cut it the other way for my look. And instead of hemming the neckline, I wanted my dress to be a little closer to my inspiration piece. So I used the black stripe in the fabric, that was serendipitously 1.25" wide. Which was perfect for a 5/8" neck binding. I just cut into the white part so that I would have a seam allowance. How I did this was to trim down the neckline on the front and the back by 5/8". And stitch the binding on as if it was meant to be like that. I'm thinking that this pattern is officially a "TNT" that I'll be making over and over. Love! Love! Love! This dress. The style is flattering on you and the fabric is amazing!!! this is beautiful. i love the way the stripes accentuate your shape particularly in the waist; i'm not sure if the stripes were cut that way its a beautiful effect. Bam! What a gorgeous dress! You did it very well, no stretching or twisting in sight ;-) good job! Simple and perfect! i'm sure this will get plenty of wear! I'm sure I will! Thanks Mette! JUST like the inspo! I love when it works out that way! Wow! That's fantastic and it looks great on you! Great pictures, too. WOW! You did a FANTASTIC job & You look GREAT in the dress! Runway worthy! This pattern is the silhouette of so many rtw dresses. It sure is. That's why it'll always be one I'll reach for! Beautiful dress and you look stunning in it! Great job. You better work it then Ms. B. Love it! 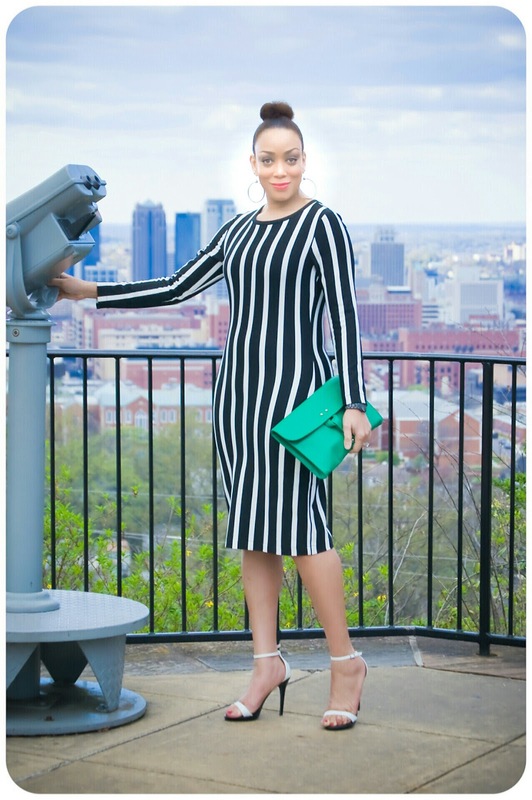 Striped dresses are very much in! Wonderful dress, and yep I do the same thing, I have a couple of clothing catalogs that come to the house and I use for inspiration. I cut out the pictures of dress that may be close matches for patterns I have, and make my version. This is gorgeous. You are killing this dress. Gotta agree with Re... you are absolutely KILLING it in this dress. Question (always with the questions)... how do you store your TNT patterns? I use large clear plastic file folders with either a tab closure or a zip top. I fold them and put them back in their original envelope. Thanks Grace! Love it, the lines are perfect and you look amazing (as always)! You definitely have succeded in recreating the look. Love it. Great looking outfit. It's audaciously trendy. You look fabulous. 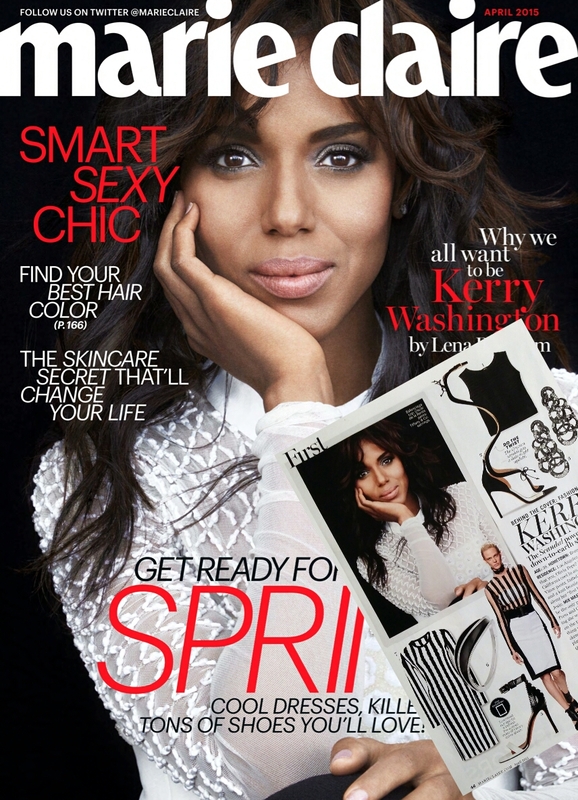 BTW I received myvissue of Marie Claire too. It's loaded with hundreds of ideas for spring/summer. It's a great issue! Thanks Cennetta! Very elegant vertical stripe dress! Love the classy monochrome palette too! I love this dress. Did you shoot this at The Vulcan? I totally agree , I have a folder where I put my tear sheets , I just tear and put them inside clear sleeves and anytime I'm stuck I just go through them. I figure they are the geniuses of fashion , lets pick there brain right? I live how you made a perfectly Alexander Wang inspiration , TERRIFIC!!! Keeping them in a folder is an awesome idea! Thanks Ines! As usual you nailed it! This is one of my favorite patterns also. I love this in stripes, beautiful! Also it fits you perfectly. Did you cover stitch the hems or do a blind stitch? I actually just did a regular hem. I made this dress from cut to finish in an hour. Thanks Levone! Bobbi Brown Cosmetics at Belk at The Summit! Gus Mayer Spring '15 Preview!